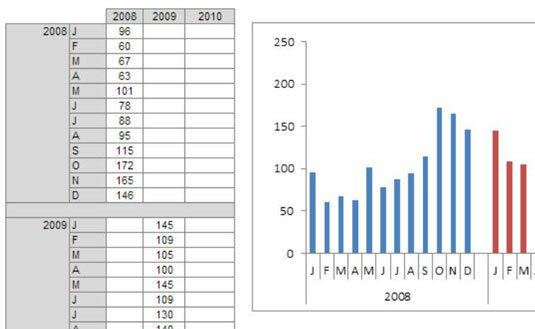 One of the most common concepts used in Excel dashboards and reports is the concept of trending. Comparative trending is a simple concept. You chart two or more data series on the same chart so that the trends from those series can be visually compared. 1Structure your source data similar to the structure shown in this figure. Note that instead of placing all the data into one column, you’re staggering the data into respective years. This tells the chart to create three separate lines, allowing for the three colors. 2Select the entire table and create a line chart. This creates the chart shown in this figure. 3If you want to get a bit fancy, click the chart to select it, then right-click and select Change Chart Type from the context menu that opens. The Change Chart Type dialog box opens. As you can see in this figure, your chart now shows the trending for each year in columns. 5Would you like a space between the years? Add a space in the source data (between each 12-month sequence), and a space is added in the chart. This figure shows each year separated with a space.